I spent quite a bit of time experimenting with doors and the way they opened. I tried foreshortened doors that fit exactly with the perspective of the walls, I tried doors that were shown front on or side on depending on their position. In the end I decided that utility should come first, so I opted for the front facing variety with a collapsed version to indicate an open door and a alternative graphic for broken doors. Below are a selection of doors intended to cover a range of durability and visibility options. So a curtain would offer no protection when closed but would block line of sight completely, a wooden door with a peep hole would offer some protection whilst allowing a line of sight when next to it and a metal grill would offer a free line of sight, good protection against melee attacks and no protection against ranged weapons. Of all the tiles I am making, without a doubt the hardest to program for will be roofs. So if you planned on having towns in your game sorry in advance. I am still working on the roofs but the images below show the layout I will be using for their geometry. I'm making three sets of roof tiles. the first will be for thatched buildings, the second will be steeply pitched tiled roofs (churches and such like) and the third and simplest will be ramparts. The templates below are mock ups intended to show every possible angle juncture. 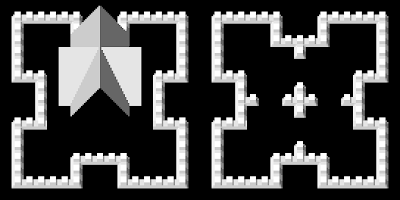 I will texture them and slice them up into 8 by 8 tiles, keeping one of each unique tile. I've not counted how many this will be but it will be it'll be loads. Hopefully these tiles will allow you to place a roof on any procedurally generated building footprint (within reason). I feel like I'm going overboard on this but its quite fun. Click to see full size images. New year new update, and today we are going to be talking about recessed floors! how exciting. 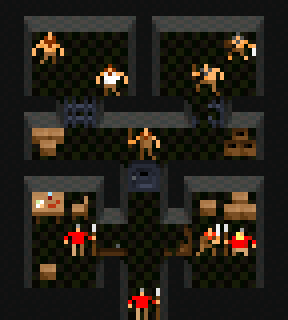 Basically I have added tiles that allow for depressed areas of floor in dungeons, these depressions can then be filled with various entertaining elements, like flaming hot magma, fuming acid, filthy sewer water or swirling mists. In addition to looking pretty snappy, these should open up some nice new game mechanics: equipped armour could rust if you wade through water too long, floor tiles could drop away into lava the second you step off them, yawning gulfs could be spanned with flammable rope bridges, etc etc. In addition to the more dramatic effects the depressed tiles can also be used on top of a solid floor to create slight height difference. This could be purely aesthetic or it could give you a slight advantage when beating down on an enemy. All told these should interrupt what would otherwise be a level and uneventful playing field.